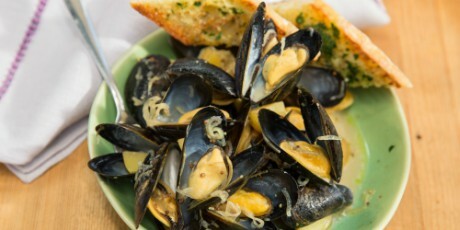 Wheat beer and mustard create a creamy sauce for PEI mussels and baby potatoes. 1. Put the potatoes in a saucepan and add cold salted water to cover. Cover the pan with a lid, bring to a simmer and cook until just tender, 10 to 15 minutes. Drain. 2. Add the potatoes, beer, shallots, butter, mustard and garlic to a 6- to 8-quart slow cooker, cover and cook on high until the liquids are at a simmer, about 2 hours. 3. Season with salt and pepper, then add the mussels. Cover and continue to cook on high until the mussels open, 15 to 20 minutes. Discard any unopened mussels. 4. Stir in the sour cream at the end and finish with the scallions on top. Serve with toasted garlic bread or crispy potatoes for dipping.